75% of the world’s population spends hours daily hunched over their handheld devices with their heads bent forward. The frequent forward flexion can cause spinal subluxations, misalignment of your cervical spine, stress on your supporting ligaments, tendons, and musculature, commonly causing postural distortions. Among the chief complaints associated with text-neck are neck, shoulder, back, arm wrist, and finger pain, headaches, and numbness and tingling of the upper extremities. 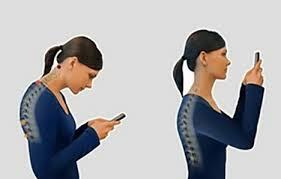 How to Reduce or Prevent Handheld Device Related Pain. Tips from Dr. Marc Wind, D.C.
Limit the amount of time and frequency that you use your device. If you have to use it for an extended period of time, take breaks. Take a 3 minute break for every 15 minutes you are texting or surfing. Stretch! One simple exercise is to tilt your head to one side (ear to shoulder) then to the other side, back to neutral, turn to look all the way to the right, then left. Back to neutral, then lean head back and back to neutral. Do all without raising shoulders. Don’t stretch forward. This only accentuates the poor posture you are trying to avoid. Do it slowly, without straining. Repeat. Pay attention to your posture. Pay attention to how you hold your device. Try to keep your wrists straight and upright. Loosen your grip when possible. Alternate the fingers you use to type; if you most often use your thumbs, try to switch to your index finger as it allows you to keep the hands more relaxed. Seek help: If you or someone you know is experiencing discomfort, do not wait. Seek Dr. Wind’s professional help as soon as possible. Taking action now could prevent serious health problems in the future. Prevention is the best cure. ← What am I going to “catch” this year?